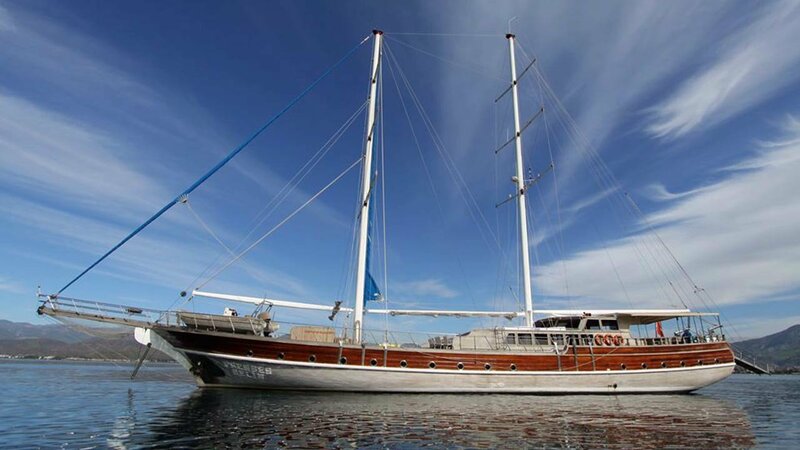 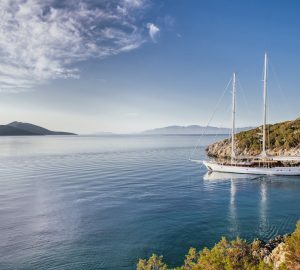 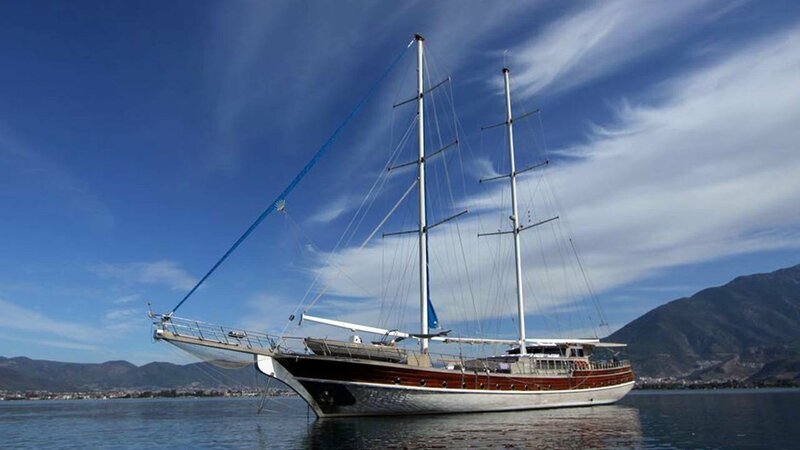 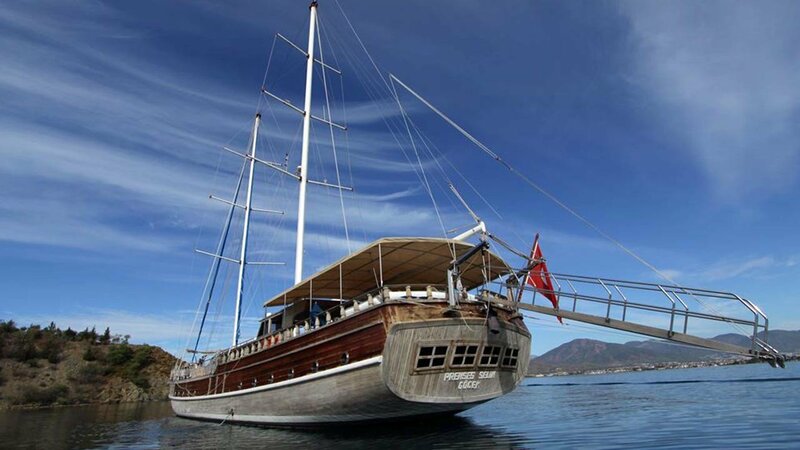 Constructed entirely from wood, this 35m/115ft luxury ketch was built in 2005 and is an elegant vessel often seen cruising through the territorial waters of Greece and Turkey. 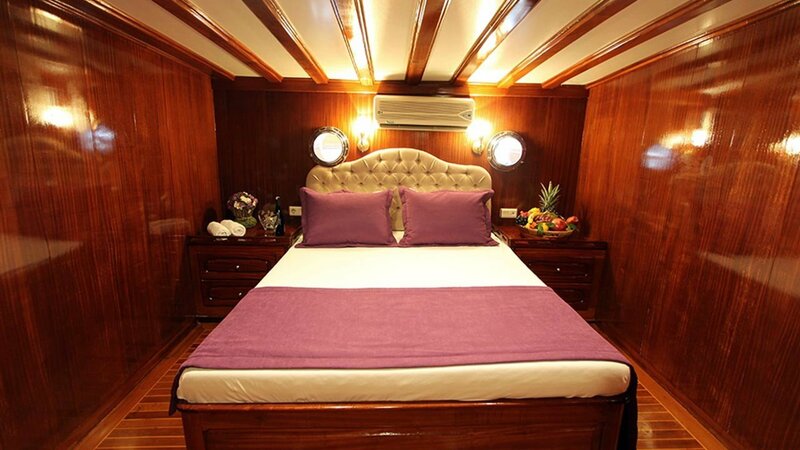 The accommodation sleeps a maximum of 20 guests over nine en-suite cabins with a crew of four for professional and discreet service. 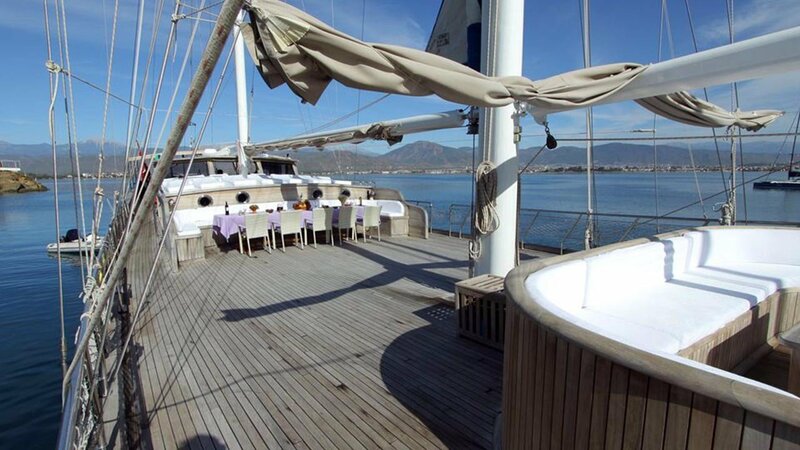 On deck, the section aft of amidships is covered by a canvas and provides an elongated rectangular table where up to 10 guests can dine alfresco. 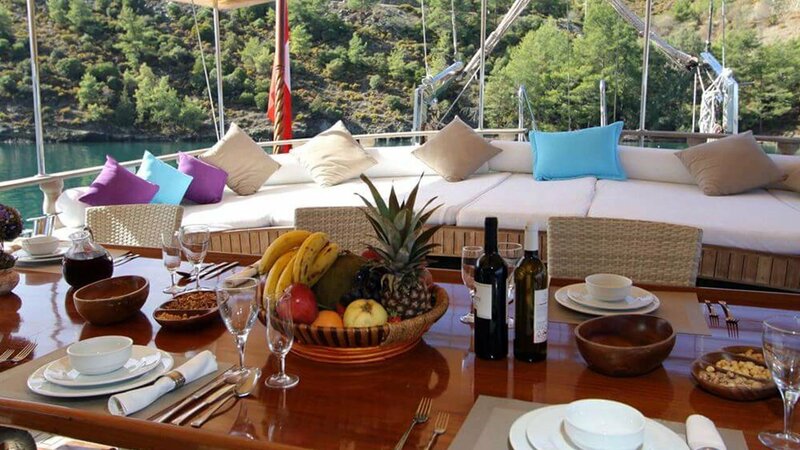 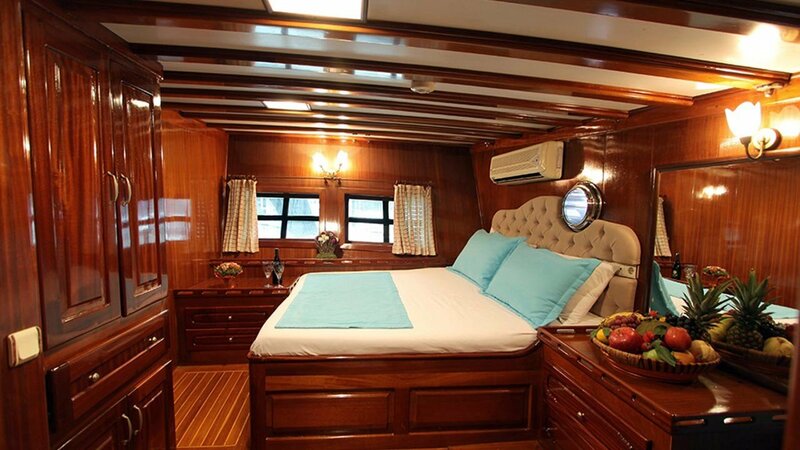 Along the stern is a broad sunbed where guests can converse or nap after a hearty meal. 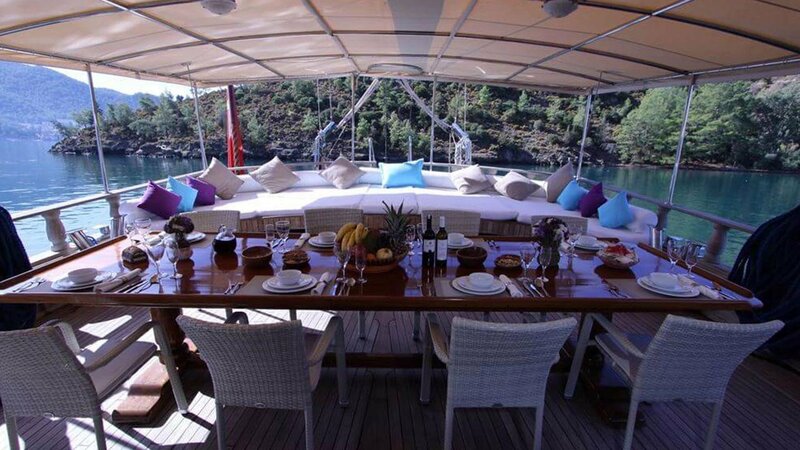 Amidships, a C-shaped sofa in front of the helm station and an elongated dining table make a sunny setting for group meals, while forward there is a cockpit lined with plush seating around a coffee table for casual drinks and relaxation. 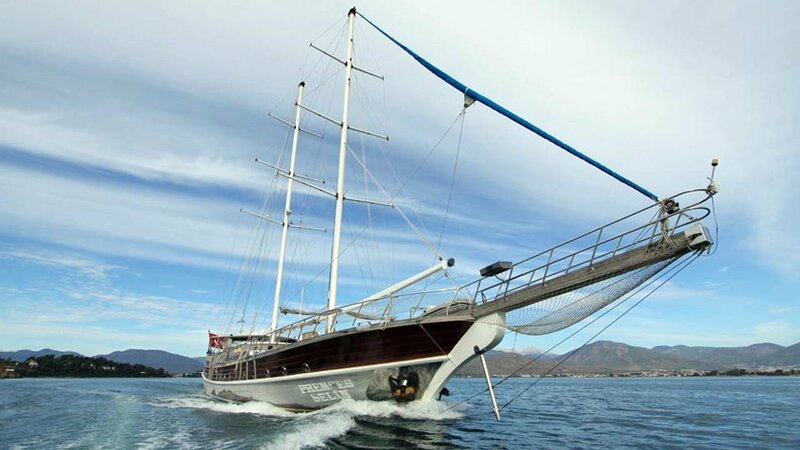 The foredeck is used to store the tender when in transit and can be used as an additional sunbathing and observation area, or for outdoor exercise. 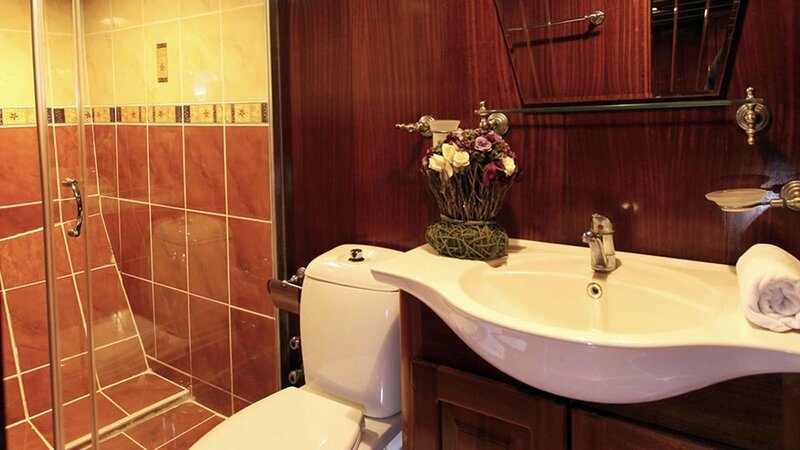 The lower deck contains the crew and guest accommodation, the latter having en-suite bathrooms consisting of a sink, toilet and a large shower with a tile seat. 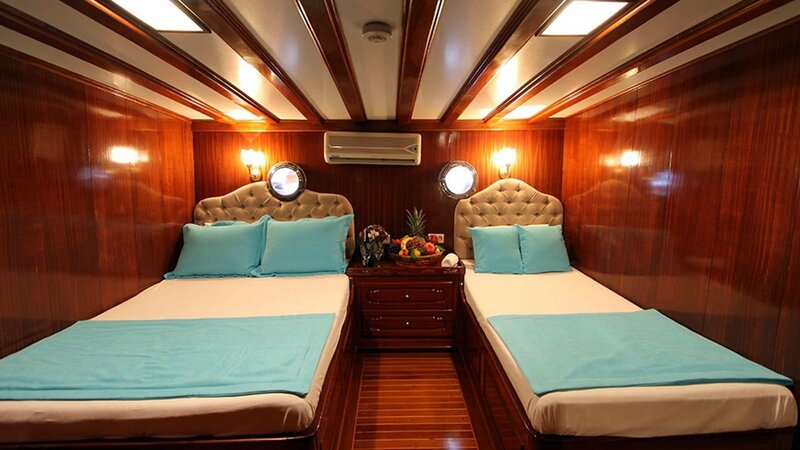 Above deck, the traditional interior uses porthole windows to the aft and large curtained windows to port and starboard for a light-filled room where guests can unwind and take in the views. 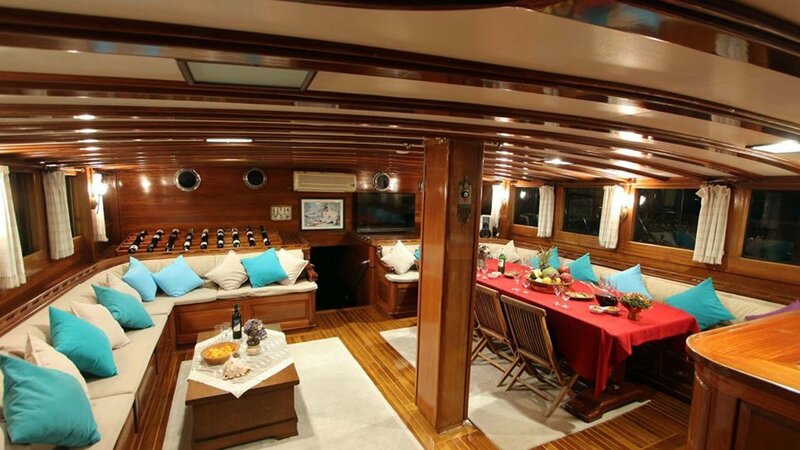 L-shaped sofas curve around the aft corner on both sides of the room, with the port side, also fitted with a raised dining table, an aft widescreen TV and a forward wet bar. 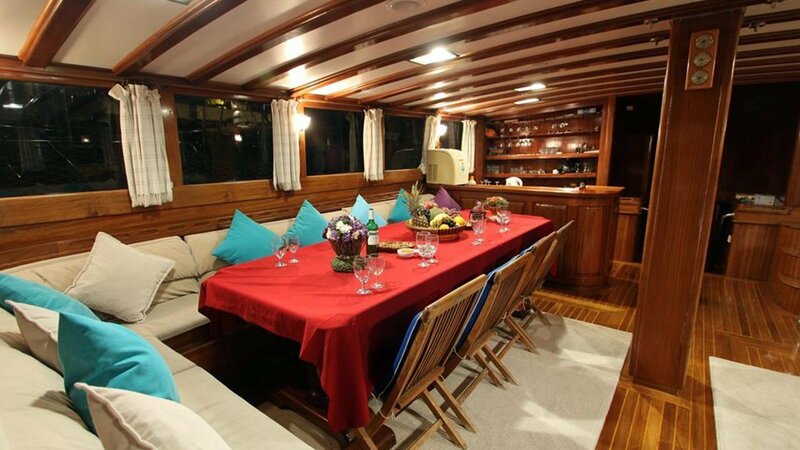 The starboard side has a coffee table and a games table to the aft. 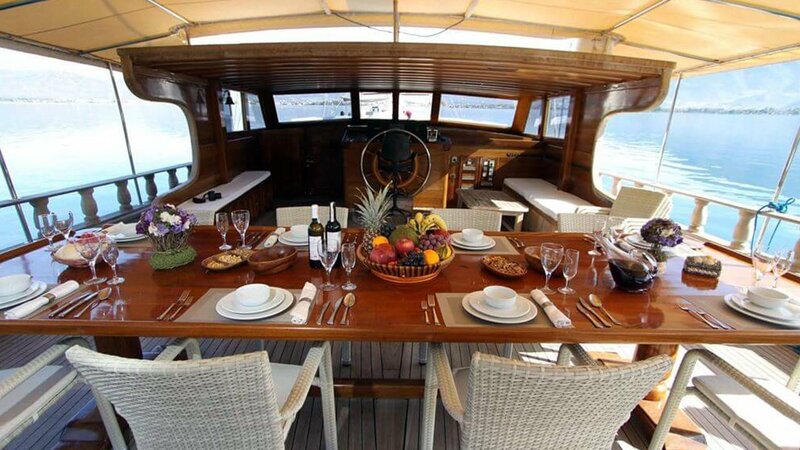 2 x Iveco engines producing 450 HP each allow for cruising in light wind conditions. 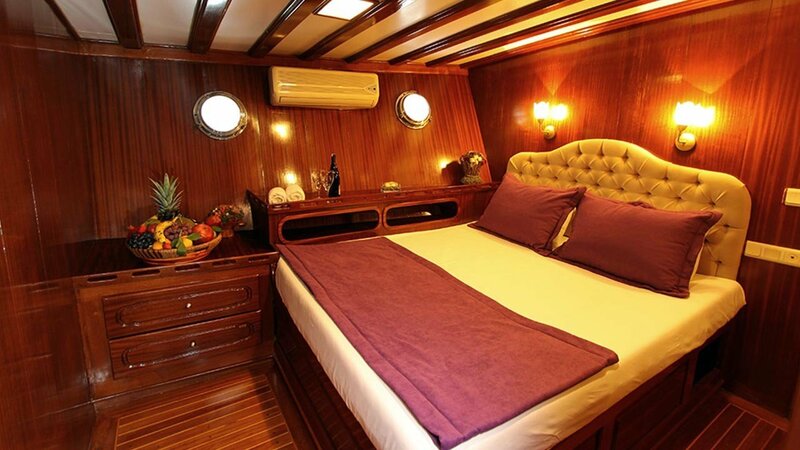 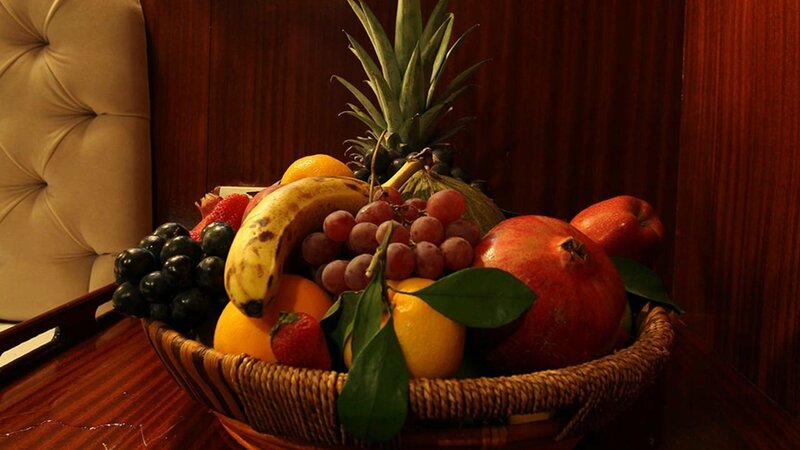 The accommodation sleeps a maximum of 20 guests over 9 cabins: 7 double cabins and 2 triple cabins. 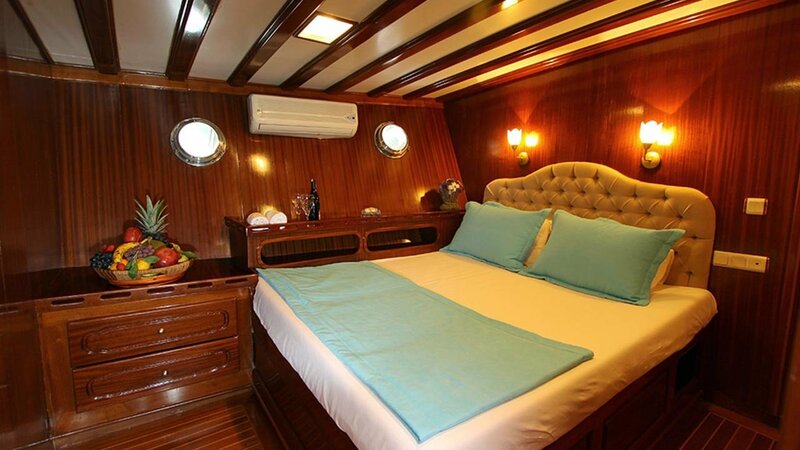 The crew of 4 will ensure that everyone on board receives stellar service throughout their time on board.